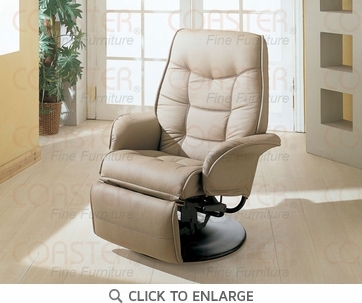 Sit back and relax with the superior comfort of this swivel recliner. The leatherette cushioned material is available in beige, making it possible to easily match existing living room decor. Flared tapered arms, plush tufted seating, a swivel motion. Fully reclined, this piece extends from 21 inches in depth to 60 inches, giving you room to stretch out after a long day of work. Dimensions: Width: 32.5" x Depth: 36" x Height: 41.5"